For my third instalment on the great composer Giuseppe Verdi, I’m jumping forward to his last but one opera – Otello. Why do this at such an early stage? Well, because I note that Otello is being performed by Opera North from January to March, and if I can help sell a single ticket for them by doing this the whole exercise will be worthwhile. As the lead roles are amongst Verdi’s most demanding it will come as no surprise to learn that some of the world’s greats have played them. Famous Otellos of the past have included Tamagno, Albert Alvarez, Francisco Viñas, Jose Luccioni, Ramón Vinay, Mario del Monaco, James McCracken, Jon Vickers and Carlo Cossutta. But it is Placido Domingo who has appeared in more video productions than any other tenor, as well as in numerous live performances on both sides of the Atlantic. Opera North is presenting a new production by Tim Albery. Iago, an ensign in the Venetian army, is a man who bears a grudge. When his general, Otello, passes him over for promotion in favour of Cassio, Iago’s festering resentment quickly turns to downright malice. He poisons Otello’s mind with suspicion, and step by step, leads Otello to believe that his young wife Desdemona is in love with the young and handsome Cassio. 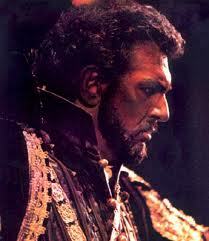 And so Iago, a man consumed by envy, makes Otello into a monster of murderous jealousy. The horror is in the very domestic tragedy that touches us all.